There are solutions to digging and pouring cement deck footings. And the options allow for supporting structures that are connected or not connected to a house. The former requires an engineered helical anchor that is resistant to surface soil movement or expansion. While the latter is for floating decks or "free standing" as they are also called. The benefit to both of these anchor styles which drive into the ground - either like a screw or a spike - is that all the time and cost of digging, mixing, pouring cement and waiting for it to cure are gone! Let's look at and compare engineered helical piers and screw or spike anchors. An excellent solution for supporting almost any structure regardless of frost or soil condition. Helical piers are proven to be very good at supporting almost any structure in almost any soil type. They are long rods with a helix at the bottom and can be made to any length. They are screwed down to whatever depth at whatever torque rating is needed to support any load. These will work for decks very nicely and you can attach your deck to a ledger if they are installed well below frost levels. But they require some machinery to do the drilling and its not a do it yourself job. But its engineered and its quick. These are a great non-concrete deck footing solution. Check out Techno-Post for more information on engineered helical piers. The common link between ground anchors for floating decks is the fact they are driven into the ground. 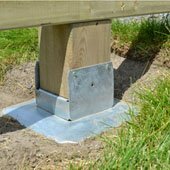 A good example of this the Oz-Deck system which uses a load plate that its fence post anchor fits through. You just need to rent an electric jack hammer and insert the correct hammer tool and away you go. 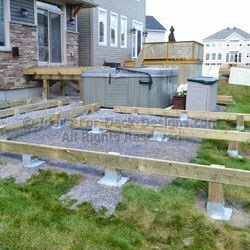 It's very fast and makes for a good secure foundation for your deck. The jack hammer even allows you to compress the plate at the end to really get the anchor settled in the soil. Contractors will appreciate the speed and won't be intimidated by using a jack hammer. If you hit an obstacle it can not push through, you will have to remove the anchor and try a new location. Overall, it is a very well made high quality product although it is harder to find these days so check directly with the manufacturer for local distribution. A floating deck avoids all the code restrictions associated to connecting to a ledger. Here is a bit of a hybrid product halfway between the traditional helical foundation and the spike system. Rather than driving down a spike, the Titan Deck Foot Anchor concept uses the screw or helix but installs with a lightweight hand held impact wrench. The impact wrench is very affordable tool starting at as little as $99. But a good one by DeWalt is $150 and up. It's so effortless practically anyone can screw down footing in minutes. And the nice part is that if an immovable obstacle like a big rock is hit, you can reverse it out and move over a few inches. 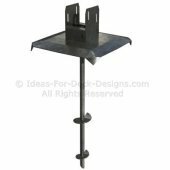 The other nice aspect is that because the post bracket is a U shape you can drop beams right into anchor and hang joists off it you can get a wood deck within 2" above the grade - if you wish. 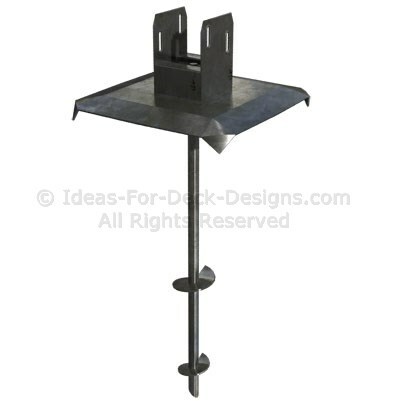 Go Learn More about the Titan Deck Foot Anchor! Here you can see how elevation changes or sloped grades are dealt with. You will have dig away a bit of the sod and soil to get an area large enough for the anchor plate to be installed level. But the post will remain dry for years to come. So you have lots of great options to choose from. 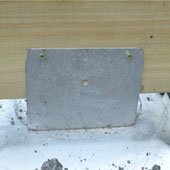 There is a ground anchor footing option for floating or ledger connected decks - without digging - and without cement.